Great experience last night at Kings Place – part of the Brahms Unwrapped season – our good friend Kenneth Hamilton playing (and talking about) Brahms’s piano music. His introductions were illuminating, informative, irreverent and witty as always, his playing quite phenomenally accurate, virtuosic and powerful: showing us Brahms in a whole new light. Ken started with the first movement of Brahms’s astoundingly accomplished Sonata No. 3 in F minor, written when he was only 20; Ken convincingly argued that the movement must have started as some kind of composition exercise based on J S Bach’s ‘Weinen, Klagen’ (with Purcellian descending chromatic bass line) in the same key. He told us that the ‘grand ending’ of the movement implied that the audience would be expected to clap; we duly did, and he said he would have been somewhat put out if we hadn’t. After the interval, we heard the last things Brahms wrote – three touching organ chorales, transcribed by Busoni. Then a little gavotte by Gluck, arranged by Brahms as an encore piece for Clara Schumann. Ken (authentically) proceeded to improvise a modulatory passage into the key of the next and final piece, the Handel Variations. Absolutely riveting performance, clearly characterising the 20 or so miniature ‘mood pieces’ of the variations – including a couple of ‘Hungarian dances’ and a musical box imitation (instructed to be played with the sustaining pedal held down so that the music jangled; and its clockwork runs down at the end!). Finally a massive and magisterial fugue, with a certain degree of pianistic sleight-of-hand but some genuinely complicated counterpoint as well. One began to view Brahms with a new respect (well, I did, at least). Ken’s performance rose to such heights of power and energy that he literally almost knocked himself out on the piano lid at the end (‘You’d think I’d know where it was by now’, he said). And a pretty encore to send us home smiling. Amazing evening. Congratulations to Ken – I haven’t done anything like justice to his constantly revelatory comments, nor to his ability to speak, illustrate and play with not a note (of words or music) in front of him. Thank you to Diana for getting us the tickets – wouldn’t have missed it for anything – and to Carol for joining us and being so appreciative. And for the dear friends we met in the audience (you know who you are!). A wonderful musical weekend. On Saturday, to Cadogan Hall for Chelsea Opera Group’s concert performance of Berlioz’s late opera, Béatrice et Bénédict. (Thank you to the Berlioz Society for the discounted tickets!) COG orchestra on sparkling form, conductor Nicholas Collon fantastic – precise, clear and engaged (grinning widely throughout the Overture!). Chorus somewhat under strength but valiant. Female soloists wonderful – Ana Maria Labin sang Héro with a lovely true soprano, Emma Carrington brought her luxuriously velvety mezzo to Ursule; their duet at the end of Act I (delicious in matching dark blue dresses) was the musical highlight of the evening. Liora Grodnikaite has come a long way since her days on the Jette Parker Young Artists’ Programme at the Royal Opera House; she sang Béatrice (without a score) with wit, fire and musicality, her looks and gestures conveying a huge range of emotions including amusement, scorn, uncertainty and confusion. A terrific performance. Her Bénédict, Ben Johnson, paled somewhat in comparison, not least because he remained resolutely score-bound. He sang very nicely, but there was no chemistry between the pair (one recalls Ann Murray and Philip Langridge at ENO all those years ago…). Simon Lobelson and Adrian Clarke were luxury casting in the minor male roles. Everyone’s sung French was excellent – a rare achievement. The wise decision had been taken to ‘stage’ the concert with three actors performing a reduced version of the dialogue in English. So we had Shakespeare interspersed with (uncredited but very witty) translations of Berlioz’s own additions to the text. Unlike their singing counterparts, there was plenty of chemistry and flying sparks between Helen Ramsorrun and Sion Davies – both final-year GSMD students (he should guard against dropping his voice, though – I didn’t always catch the words.) Donald Maxwell doubled Léonato and the Notary, as well as doing all that could humanly done with the awful role (spoken and sung) of Somarone, the joke music master who writes joke bad music… oh dear. Nice that the format followed that of COG’s previous performance in 1981, conducted by Stephen Barlow (can that really have been 30 years ago?). My only misgivings concern the piece: dear Berlioz, bless him, can’t get his dramatic pacing right, and in Act I he never knows when to stop. Apart from Bénédict’s Rondo, every number outstays its welcome (even the glorious nocturnal duet) – especially Somarone’s cod Epithalamion which isn’t funny anyway and which Berlioz insists on inflicting on us TWICE. Aarrgghh! And then Act II flashes past with undignified haste – the final duet seems over before it has begun. But all in all, a fine achievement for COG and a fun evening. Then, on Sunday, a local jaunt to St Mary in the Castle in Hastings – a wonderful venue we hadn’t sampled before (thank you Lesley and Alistair for the heads-up). Billed as a Gala Concert, the first half consisted of performances by members of Barefoot Opera, a new back-to-basics ensemble directed by Jenny Miller (whom I remember as a fine mezzo Cenerentola a while ago). But they didn’t just stand and sing: soloists appeared in different parts of the (circular) auditorium, moved among the audience, sang to each other, and generally brought their roles imaginatively to life. Kudos particularly to the charismatic Krysia Mansfield, who not only sang Tippett and Borodin but even managed to be riveting while playing a non-singing Vitellia to Aino Konkka’s Sesto in Mozart’s ‘Parto, parto’ from La Clemenza di Tito. (Even clarinettist Andrew Sparling – playing from memory – directed some of his obligato towards her, presumably in an attempt to soften her heart.) Talking of which, more kudos to Andrew Sparling for putting down his clarinet and singing a weird and powerful Ravel song, ‘Les grands vents’. Other stars included Carleen Ebbs’ sparkling and fearless ‘Je veux vivre’ from Gounod’s Roméo et Juliette – we reckoned we had heard it sung less well, to say the least, during the Cardiff Singer of the World week. And Antoine Salmon, who may not possess the world’s most beautiful bass voice but was hilarious in Rossini’s ‘La calunnia’ and as Don Pasquale playing stooge to the Dr Malatesta of Nikos Penesis. Not sure about the ensemble finale – a strange rewrite of Handel – but this seems to be part of a project they are working on. All credit to Barefoot Opera – let’s hope we hear and see more of them. Oh — and brava Nancy Cooley for her indefatigable accompanying! For the second half, Elizabeth Connell took to the stage (is it ungallant to call her a ‘veteran soprano’? ), accompanied by Stephen Rose. She treated us to a hilarious résumé of her long and colourful life in opera, illustrated by knockout performances of Wagner (‘Dich teure Halle’), Mozart (‘Non più di fiori’ from La Clemenza di Tito), and Verdi (Lady Macbeth’s ‘La luce langue’.) From low G to top B, her voice was big, true and thrilling. She then gave us an outrageous ‘Diva Song’ written for her by Betty Roe and involving many changes of hats… I say no more, You must try to see her for yourself. Her encore was the immensely touching ‘When I have sung my songs to you’ by the American composer Ernest Chance. Not a dry eye in the house (even hers!). A great lady and another great evening, rounding off a great weekend. Philharmonia/Salonen, Festival Hall – review | Music. Sorry about the legibility of the titles — disadvantage of PowerPoint if you are projecting on to a screen just below the lights shining on the orchestra and chorus (though the tech chaps did what they could to shutter the lamps off the screen). Anyway, a riveting perfomance of a stunning (and far too rarely heard) work! After an extraordinarily high-powered week of fantastic singing, a winner finally emerged at St David’s Hall on Sunday: Valentina Naforniţă from Moldova is the 2011 Cardiff Singer of the World. Immensely talented and radiantly charismatic, with a lovely crystalline voice, Valentina managed to win over the judges despite some nerves in performance (confidentially, the best performance of the week was her rehearsal in the afternoon — smiling, confident, nothing held back, no trace of nerves then). She sang Donizetti (from Lucia di Lammermoor), Dvořák (Rusalka’s Song to the Moon), and Gounod (‘Je veux vivre’ from Roméo et Juliette). The audience (at home and in the hall) loved her too – she got the Dame Joan Sutherland Audience Prize as well. I played the Grande Messe des Morts with Cambridge University Music Society (in Ely Cathedral, circa 1970), so have always loved this amazing work (and the 3rd bassoon part is engraved on my brain forever). And Diana is a Berlioz scholar (PhD) and member of the Berlioz Society, so how could we miss it. Conductor David Temple — despite his alarming resemblance to Alan Titchmarsh — did a great job. He didn’t really conduct anyone except the choir, but the performance held together and the effect was overwhelming. The Crouch End Festival Chorus delivered brilliantly — intonation, attack, energy, keeping pitch, dynamic contrasts, getting the words across, even synchronised sits and stands — all absolutely fine. (Special bravas to the two lady tenors…) The orchestra was the London Orchestra da Camera, which was a bit of a mystery — supposedly ‘ the country’s most talented freelance professional musicians’, but apart from the leader, John Bradbury (very fine), I didn’t recognize any of the names or faces. They played really well — sonorous and in tune — though they could have done with more cellos and basses (6 and 4 not enough for this piece) and occasionally felt as if they could have done with more rehearsal too. But they gave a magnificent performance. Tenor Robert Murray (a former Jette Parker Young Artist at the Royal Opera House) was, well, quite divine in the Sanctus, his voice floating effortlessly over the assembled company (from his position behind the orchestra but in front of the choir — a good solution). Slightly taken aback by the dress code — gents of the orchestra in full white tie and tails, ladies in workaday all-black (mostly trousers), choir all in black. Conductor in a black bin liner worn outside his trousers* (an unflattering fashion also affected by Tony Pappano at the ROH). And I haven’t even begun to enumerate all the things that are so extraordinary about the piece. It has been described as ‘really an opera’, like the Verdi Requiem – but it’s also an experimental laboratory of orchestration (chords on three flutes accompanied by trombone pedal notes? Two cors anglais? Six pairs of timpani? Not to mention those four brass bands up in the balcony — I defy anyone to hear it live and not have shivers up your spine, if not a lump in your throat and tears in your eyes. What an extraordinary composer.) Well, just get hold of the Colin Davis recording and hear for yourself! Many thanks to the Berlioz Society for our excellently placed seats. Would be interesting to hear from anyone else who was there? Didn’t spot many familiar faces among the (not full) audience. If your own orchestra or choir ever gets an invitation to perform this piece, don’t hesitate! As I recall from a hundred years ago, it’s great fun to play as well as to listen to. And Berlioz writes for four bassoons, so he has got to be a good thing. * For elucidation: David Temple actually wore an open-necked black shirt outside his trousers. Tony Pappano sports an oversize collarless black shirt for which my boss coined the pejorative (but graphic) description ‘black bin liner’. Comfortable, perhaps — but a disconcerting sight at recent concert performances of Les pecheurs de perles when the entire ROH chorus as well as the orchestra and soloists were in full evening dress. Extraordinary concert at the Barbican on Sunday night (6 June) – Thomas Adès conducting the LSO. First, his orchestral work …and all shall be well, inspired by the familiar mantric words of Julian of Norwich. Superficially simple and tonal, with instruments doodling up and down scales – but strange smeary things were happening en route in a particularly Adès-ian way. And a glittering final chord with a high major third floating on top – Aha! Stravinsky Symphony of Psalms, I thought to myself. And I knew that if you had said this to Adès he would have replied ‘Any fool can hear that’. I have not always been convinced by his music, but he certainly has immense gifts and a distinctive voice. Then a major (over-long) pause for platform rearrangement – and the fun of watching a second Steinway come up in the magic Barbican lift. Zoltán Kocsis played Bartók’s Piano Concerto No. 1 from 1926 – very bristly and percussive. The featured timps and percussion were brought to the front of the stage (Kocsis’s idea or Adès’s? ), thus enabling us to see every detail of Bartók’s demands for different sticks, different ways of hitting a suspended cymbal, and so on. Just a pity that the lady playing tam-tam was hidden behind the piano and largely inaudible. The performance was not quite successful: because of the layout, woodwind and strings seemed somewhat muffled, and ensemble was very rocky at times (better in the morning rehearsal, I have to say). After the interval, a little Adès showpiece – These premises are alarmed; more lovely sounds, though as by now I was sitting in my ‘box’ it was hard to hear. Gerald Barry’s music has flummoxed me in the past – I’ve tended to think ‘It will be all right when he’s put the expression marks in’; very aggressive, few slurs, sometimes very loud, lots of unisons and sforzandos, much machine-like repetition. But once I had got my ear in, the music was just right for this piece, conveying all levels of expression from calm to watchfulness to nervous tension, playfulness, hysteria, rage, and even belly-laugh humour at times. And finally, three dances from Adès’s early opera Powder Her Face, full of the student exuberance of youth – plenty of pastiche and fun and games – but showing a composer already completely in control of his fertile imagination. And, not incidentally, showing himself these days a conductor completely in control of his players (who were having a whale of a time). What a great Prom programme the whole concert would make! BBC please take note (if you haven’t already). 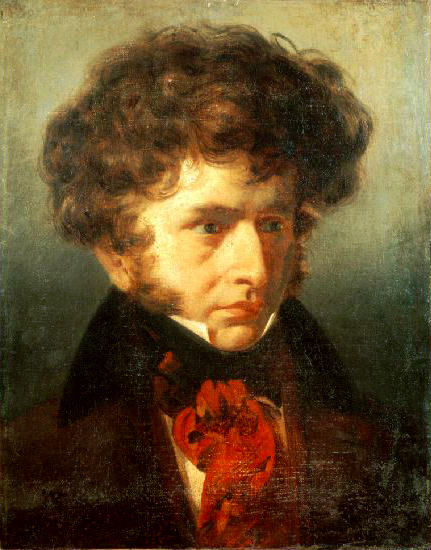 Diana’s comment was that the liberating, ear-opening thrill of the whole concert, and particularly the Barry, must have been equivalent to the effect on its first audience of , say, Berlioz’s Symphonie fantastique; marvelling at sounds, colours, effects and all sorts of things that music could do that one would never have imagined to be possible. As I said – an extraordinary concert.